The looming offseason for the Miami Dolphins can only be characterized as a make-or-break one, considering the team has five picks in the first three rounds as well as a roughly projected $45 million in cap room. It goes without saying the Dolphins will have the cap flexibility to make a large splash in free agency, hopefully luring a playmaker or two away from other teams. But they would be wise to not go overboard with their new-found cap space and some of that will need to be devoted to re-signing the team's own free agents. 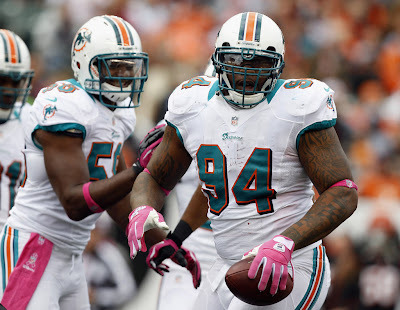 In this article, I take a look at every player on the Dolphins' 2012 roster with an expiring contract this offseason. That includes not only the high-profile unrestricted free agents, but restricted and exclusive-rights free agents as well. Restricted Free Agent — A player with an expiring contract and three accrued seasons. The Player is tendered one-year contract offer by the original team at one of four salary amounts, which can be signed by the player at any time. Other teams are free to make offers on these players, but the player's original team has the option to match any offer and retain the player's services. If another team signs an RFA and the old team does not match, the old team gets draft pick compensation determined by the level of the original tender (either a first- and third-round pick, a first-round pick, a second-round pick, or a pick from the round in which the player was originally drafted). If not tendered, the player becomes an unrestricted free agent. Exclusive Rights Free Agent — A player with an expiring contract and between zero to two accrued seasons. The original team has the option of tendering a one-year contract offer to the player, in which case the player must accept the offer or not play. The player has no rights to negotiation with any other teams. If not tendered, the player becomes an unrestricted free agent. RB Reggie Bush — Bush fell just short of his second consecutive 1,000-yard season, but he's been a tremendous steal for the Dolphins since being acquired in 2011 and has shown in Miami an ability to run between the tackles and stay healthy. In addition to his incredible physical tools and receiving ability, Bush is easily one of the veteran leaders and hardest workers on the team. I expect the Dolphins will try to re-sign him to a reasonable contract for three or four years, but my concern is that another team will overpay him. In that case I probably move on with Daniel Thomas, Lamar Miller and possibly some new acquisitions because I don't believe in overpaying for running backs. But I certainly can't imagine how someone could be against re-signing him for the right price. FS Chris Clemons — A fifth-round pick in 2009, Clemons is coming off his best career season, starting all 16 games for the first time and setting career highs in tackles (99) and interceptions (2). I question Clemons' long-term upside and he's been a little inconsistent for my taste, but I would not be opposed to bringing him back on a reasonable two- or three-year deal. The question is what kind of market he'll have and if the Dolphins will entertain pursuing a high-profile guy like Jairus Byrd to pair with breakout strong safety Reshad Jones. S Tyrone Culver — A quality special teams player and reserve defensive back for the previous four seasons, Culver was cut before the 2012 season and remained a free agent until rejoining the Dolphins in early December. He didn't make a noticeable impact and I suspect he'll have a hard time getting a deal with any team early in the offseason. TE Anthony Fasano — Of any player on the Dolphins, Fasano is probably the most unfairly hated and criticized. He certainly lacks elite receiving skills and isn't a matchup nightmare like a Rob Gronkowski or Jimmy Graham, but if anything I'd say Fasano is a solid and undervalued player. He's a solid, reliable receiver and an excellent blocker, which is why I'd be willing to pay him a couple million for two or three more years to serve as a short-term starter and No. 2 tight end in the event the team finds more of a pure receiving threat at the position. OT Nate Garner — The Dolphins' most versatile backup for the past few years, Garner can play every position on the line. He was inconsistent but surprisingly productive at times late in 2012 when he started at right tackle after Jonathan Martin moved to the left side. Still, I question his pass protection abilities and I'd say he's far more suited for a "sixth man" role than he is a starting job. I'd certainly take him back if the price is right but I don't look to him to start in 2013 and I wouldn't overpay. WR Brian Hartline — I'd said before the season that Hartline could be a 1,000-yard receiver on a good team. Turns out, he can be a 1,000-yard receiver on a bad team when he's the No. 1 receiver. Granted, Hartline should not be your top option in the passing game, but he has deceptive speed, good hands and incredible body control for sideline and diving grabs. I'd be willing to dish out $5-6 million per season to retain Hartline's services and I believe he could really thrive if the Dolphins find a true No. 1 wideout and Ryan Tannehill continues to develop. K Nate Kaeding — Signed with two weeks left in the season thanks to a Dan Carpenter injury, Kaeding had a rough go of it in Miami, going 1-for-3 on field goals with one blocked. Carpenter may face competition in 2013 due to high salary, but I suspect Kaeding wasn't viewed as anything more than a veteran fill-in during the season and he probably won't be back. OT Jake Long — Easily one of the most controversial free agent situations the Dolphins have this offseason, the former No. 1 overall pick and four-time Pro Bowler hasn't made Miami's decision easy with serious durability issues over the past couple seasons and an uncharacteristically bad 2012 performance. If Long comes to me and asks for Joe Thomas money (in the seven-year, $84 million range), I tell him best of luck in all his future endeavors and help him pack his locker. The franchise tag is an option and the Dolphins can afford it without issue, but I don't even know if there's a point. Long doesn't look like he can hold up over a 16-game season anymore and I honestly can't explain how bad he was in 2012, regardless of scheme change. It's an unfortunate turn of events for a guy that once looked like a lifetime Dolphin and future Hall of Famer, but the Dolphins would probably be better off moving on from Long in 2013. DT Tony McDaniel — McDaniel battled an injury early in the season and saw his average snaps per game drop from 27.9 in 2011 to 23.2 in 2012. He also graded out negatively and hardly stood out when on the field. I wouldn't expect him to be greeted by a huge market and it's possible the Dolphins could try to bring him back for depth if Randy Starks walks, but my guess is the Dolphins will try to get younger at the position and move on. QB Matt Moore — Moore led the Dolphins to a strong finish in 2011, but I have to believe the team just isn't that high on him when they skipped right over him after David Garrad's injury to Ryan Tannehill in the preseason. My guess is he'll look for a better backup situation elsewhere with the chance to compete for a starting job. Meanwhile, if the Dolphins are genuinely high on Pat Devlin, they could be looking to move on as well. CB Sean Smith — After Long, Smith is probably the next most controversial free agent for the Dolphins this offseason. The pros to re-signing him are that he's got a ton of experience, he's 6-foot-3, and he's still young with ton of upside. The cons are that he may very well get overpaid because of the aforementioned attributes, when in reality he's been maddeningly inconsistent and at times just downright bad. The Dolphins are very thin at corner with the average and injured Richard Marshall, newcomer but nickel corner Dimitri Patterson and two guys with questionable upside in Nolan Carroll and Jimmy Wilson. I suspect the Dolphins will push to re-sign Smith to a good but not ridiculous contract and I do believe the franchise tag could be in play here. For those overreacting to the notion by pointing out that Smith isn't "worth" the franchise tender amount (around $10 million), my point remains that it's not going to affect the Dolphins' spending in 2013 and has no effect on the team's future years either, so it's simply a tool for keeping their best pure talent at the position around for one more season to see if he can put it together and earn an extension. DT Randy Starks — I'm extremely torn on Starks, because he's been a great signing for the Dolphins and a Pro Bowl-caliber player for much of his stint here. He's still on the right side of 30 and doesn't seem to be wearing down. On the other hand, he could command good money and the Dolphins already have Paul Soliai locked up in 2013 and former first-rounder Jared Odrick waiting to move to his true position. As much as I hate to say it, it's probably most logical not to waste good money on Starks and instead let him walk, although I still believe he has plenty of good football ahead of him wherever he ends up. S Jonathon Amaya — Dealt to New Orleans in the Reggie Bush trade in 2011, Amaya returned to the Dolphins this season and continues to be a special teams ace. His arrest for assaulting a cab driver late this past season won't help his stock, but it's good for him that he wasn't cut on the spot and thus may still be in the team's good graces. I think there's a chance he gets an original round tender (roughly $1.3 million but no draft pick compensation as he was undrafted), but at the very least the team could non-tender him and try to re-sign him for cheaper. TE Jeron Mastrud — In his third season with the Dolphins, Mastrud played just 100 offensive snaps working behind Anthony Fasano and Charles Clay, catching zero passes. I honestly don't see any upside here, but my best guess is he'll be non-tendered and re-signed for depth/competition considering Fasano is a free agent, Clay is coming off a knee injury and 2012 third-rounder Michael Egnew is a waste of human tissue. CB Bryan McCann — A depth signing in November, McCann worked his way into significant action due to injuries and actually held his own pretty well, seeing extensive playing time the final three weeks and grading out positively in Weeks 15 and 17. The 25-year-old is also a capable returner, and all things considered, I'd certainly bring him back to compete on an original round tender ($1.3 million) or even a second-round tender ($2 million) since he was undrafted. It seems like a lot, but none of it's guaranteed if he doesn't make the team. WR Marlon Moore — Moore failed to take advantage of late-season injuries at the wide receiver position, instead seeing decreased snaps over the final three weeks and losing significant playing time to rookie Rishard Matthews and waive claim Armon Binns. He also struggled in his primary area of special teams, committing a team-high three penalties and missing three tackles. I suspect he won't be tendered, though re-signing for less remains a possibility. LB Austin Spitler — A 2010 seventh-rounder, Spitler spent the 2012 season working purely on special teams for the third straight year and saw just 11 snaps on defense this past season. There really isn't any upside here and I'd probably non-tender him, but I would bring him back cheaper as a familiar face to compete in camp. OT Patrick Brown — In his second stint with the Dolphins, Brown spent four weeks on the Dolphins' roster but didn't see game action. I would expect him to be tendered and brought back in camp to work at either tackle spot. QB Pat Devlin — Hard Knocks showed us that head coach Joe Philbin may be fairly high on Devlin as a project, and the Dolphins only have one quarterback signed in 2013 and that's Tannehill. Devlin is pretty much a lock to return on an ERFA tender and could even push for the No. 2 job if he continues to develop. CB R. J. Stanford — A waive claim from Carolina before the season, Stanford spent most of the season as a backup corner and saw his defensive snap count drop over the final five weeks from 40 to 18 to 15 to five to zero. I don't see much upside here and he didn't show well in the field, but the Dolphins can retain him for cheap and usually bring 10 or so corners to camp, so I suspect he'll be back. If I'm the Dolphins, I let Jake Long and Randy Starks walk, along with other UFAs like Matt Moore and Nate Garner. I re-sign Sean Smith if it's reasonable and possibly tag him if it's not. (You can argue with me all you want, but there is no downside to this.) I push to re-sign Reggie Bush, Chris Clemons (if cheap), Brian Hartline, and Anthony Fasano, although I fully intend to add playmakers to the wideout and tight end positions. The Dolphins can use quality players like Hartline and Fasano, but Hartline would be better served as a No. 2 or 3 receiver and Fasano as a second tight end. I'm also willing to bring back all of the RFAs and ERFAs, although the only RFA that I'm really okay with paying the tender amount is corner Bryan McCann because of the promises he showed late in 2012. I might tender Amaya as well thanks to his special teams prowess. Other than that, I non-tender the other three RFAs and offer them take-it-or-leave-it deals around the minimum. The ERFAs are cheap to re-sign and thus should all return for camp. It's certainly going to be an interesting offseason and Jeff Ireland will have plenty of cap room to add quality free agents and retain some key players of his own. I'm also curious to see if the team frees up any more cap space with roster cuts or contract extensions, which I'll take a look at on Friday so stay tuned!